Dillingham and Streeter came up with the name of their brewery by looking at his surroundings in DeWitt. 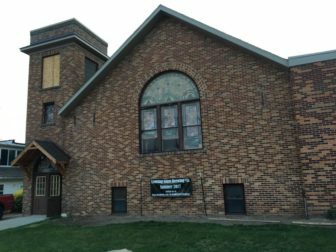 “At first, my employees and I liked the name of the river going through DeWitt Looking Glass River but after we walked through the vacant church with the incredible stained glass it confirmed the name of our brewery,” said Dillingham. There were many factors why Dillingham and Streeter decided to open their brewery in downtown DeWitt. Dillingham assured that there wouldn’t only have beer on tap. It will be offering wine, cider, mead, and two non-alcoholic beverages. As for the food portion of the menu, they’re going to serve homemade appetizers, salads, sandwiches, and dinner platters that focus on meat pairings with their beers on tap. 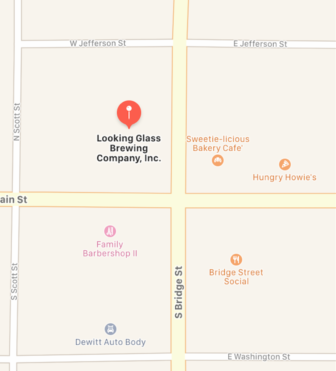 Daniel Coss, the city administrator of DeWitt said he couldn’t be any happier that Looking Glass Brewing Co. is opening up in his city. The state of Michigan is fifth in the U.S. in the number of breweries. With help from cities like Grand Rapids and Traverse City, is known to be a popular beer destination and DeWitt is looking to contribute. Craft breweries can impact the U.S. economy positively. A study conducted by the Brewers Association, highlighted the impressive statistic that the craft brewing industry contributed more than $55 billion to the U.S. economy. Not only do craft breweries help the economy but they also create jobs. Many factors play into why breweries are such an economic success. Some of the factors include it helps that a brewery is located in a destination area of the city, is in walking distance where people live, that it has consistently good food, and, of course, that it serves delicious craft beers. According to Dillingham, by the time the brewery opens, the project will cost over $700,000. The good news is that breweries are known to turn a profit early on. If you’re looking for a new taste of craft beer, head to Looking Glass Brewing Co. and join the community of DeWitt. They are located at 115 N Bridge St. right across from The Crafted Bean and Sweetie-licious. Michael is a native of Florida. He is a writer for Spartan Newsroom. He loves writing about controversial sports topics for his blog. Michael is a dog owner to a cockapoo named Oreo.